James @Women just received a whole lotta precious vintage magazines from a casting director friend. What a lucky guy! so simple yet so strong. A classic Fabien Baron look but the model’s features are a little too harsh. She looks a little like Lauren Hutton. well this was the 80s, no airbrushing …. according to James, she’s the first Women mgmt model to appear on VI. I have not heard of her… but she looks interesting, that kind of interesting that Meisel will like. 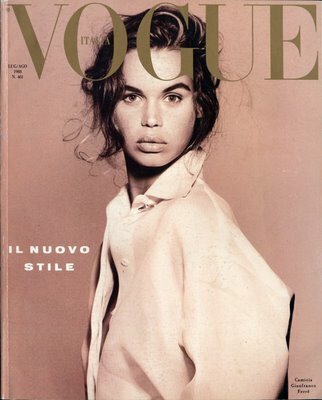 I think Robin is American and worked successfully-ish for a few years especially in Europe before stopping to pursue her studies.She epitomised a certain European look of the mid and late 80s of androgyny and bee stung lips.The aim was to make it all look ‘effortless’.Meisel and other photographers like Paolo Roversi and JB Mondino led the way at the time with this genre of abstract and washed print work.Only Italian and French magazines got get away with it at the time.JMO. P.A.B. — as informative as ever! This is really down-to-earth and beautiful, Meisel has certainly brought his style to greater heights! I love this! Why don’t you like the Eliza Cummings cover?